I must confess, I am a bit of a study enthusiast. It may stem back to my days as a chemist, but I love a big data chart and well done graph. This morning, Pew Internet released a new study on Teens, Social Media, and Privacy. This study is the sequel to their first report from 2007, Teens, Privacy and Online Social Networks. The 2012 report contains good news as well as some areas to work on. Teens are sharing more personal information online. In every category, teens shared more information in 2012 than in 2006. One of the biggest jumps was sharing cell phone numbers. In 2006, only 2% shared their cell number online compared to 20% in 2012. Although sharing more personal information, teens are taking steps to manage their online reputations. 60% of teens kept their Facebook profiles private. More than half of online teens (57%) said they decided not to post something online because they were concerned it would reflect badly on them in the future. Teens also reported having adults on their networks influenced their decision about whether or not to post something. The pressures of college admission and employment seemed to have a big influence on their online behavior. 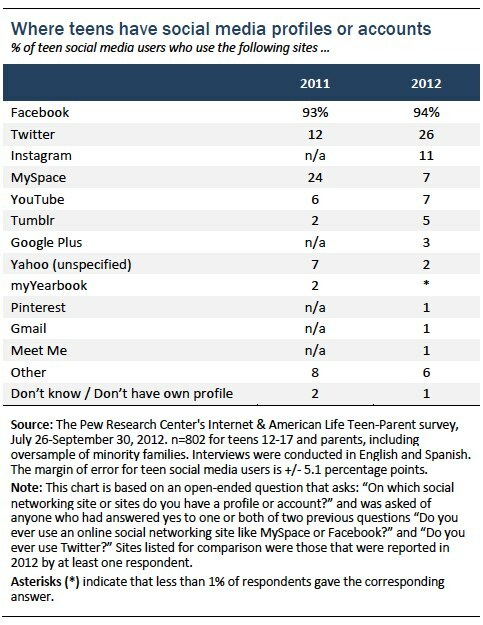 Teens are not abandoning Facebook but are adding other social networks. Facebook was still the #1 social media site for teens. But, the study found teens were not thrilled with Facebook. Teens commented on how Facebook was overrun with adults and too much drama. Despite this, teens were not leaving Facebook. Instead, they spent more time on other social networks. Both Twitter and Instagram had over a 10% jump in teen users. Teens view life online as more positive than negative. 52% of online teens said they experienced something online that made them feel good about themselves. Only 4% of teens reported sharing sensitive information online that caused a problem for their family or at school. However, one in six online teens said they were contacted by someone online they did not know in a way that made them feel scared or uncomfortable. Girls online were twice as likely as boys to experience this unwanted contact. (24% vs. 10%). For more information, the full report is here or listen to Amanda Lenhart from Pew Internet discuss this report with Larry Magid. May 21, 2013 in Kids Privacy.